I could just say, "Hey, watch this movie. It's Johnny Depp. A Johnny Depp film directed by Tim Burton. How could you go wrong?" But I figured that you, a discerning moviegoer, a student of pop culture, might want a little more than just "It's Johnny Depp." I'm going to assume that you know, or have some inkling, about Washington Irving's The Legend Of Sleepy Hollow. If not, please go back to your high school and berate your English teacher for failing you. Anyway, just quickly, the story is about a Connecticut school teacher who goes to rural New York in search of a wealthy wife, but finds only terror in the form of the Headless Horseman. The Crane of Irving's vision was "was tall, but exceedingly lank, with narrow shoulders, long arms and legs, hands that dangled a mile out of his sleeves, feet that might have served for shovels, and his whole frame most loosely hung together. His head was small, and flat at top, with huge ears, large green glassy eyes, and a long snipe nose, so that it looked like a weathercock, perched upon his spindle neck, to tell which way the wind blew." Um... yeah, that's not the Depp version. So, if you were looking for a faithful adaptation, well, you won't get it here. 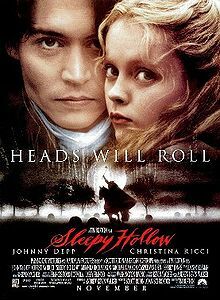 In Sleepy Hollow, Depp is an exiled New York City policeman, ordered by his superiors to use his "new" theories of deduction and crime-solving, a la Sherlock Holmes, in a case involving a rash of beheadings in Sleepy Hollow. Depp, as Crane, does believe in the presence of the spirit, but also believes that this Headless Hessian is controlled by someone of flesh and blood with nefarious motives. Burton and Depp do take other liberties with the story: Depp's Crane is a hero and does eventually get the girl; Bram Van Brunt (Bram Bones) does not. His second film with director Tim Burton, Ed Wood marked the first film in which Johnny Depp portrayed an actual person. It was also one of his best films. 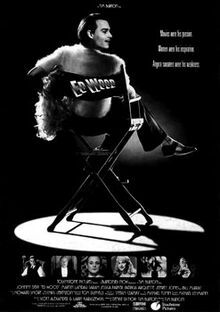 Ed Wood truly felt like a Johnny Depp movie: like Cry-Baby, Edward Scissorhands, Benny & Joon, and What's Eating Gilbert Grape before it, Ed Wood was filled with society's unwanteds, castoffs, and oddballs. Only these people were real, not just visions in some screenwriter's imagination. You had Tor Johnson, a bald, dim-witted hulk who, like George "The Animal" Steele who portrayed him, was a professional wrestler before becoming an actor; Bela Lugosi, famous 1930s horror actor and star of Dracula, played by Martin Landau, who won an Oscar for his performance; Vampira, a female vampire character, portrayed by Lisa Marie who, like Depp, has been featured in several of Burton's films; and drag queen Bunny Breckinridge, played by Bill Murray. But at the center of it all was Depp's Ed Wood, the transvestite director notoriously famous for birthing some of the worst films in the history of mankind. According to The Internet Movie Database, Depp claimed his portrayal was "a mixture of the blind optimism of Ronald Reagan, the enthusiasm of the Tin Man from The Wizard of Oz (1939), and Casey Kasem." I should preface this with the note that my older brother is mentally disabled, so it is probably no surprise that What's Eating Gilbert Grape had a profound impact on me. Amid movies that glamorized special needs, or prettily glossed over them, or were considered (supposedly, sickeningly) "hilarious", this was the first time I saw a semblance of real life reflected back at me. It is the story of a young man who is trying to find himself under the friction of family dynamics that he can't escape. Gilbert Grape's family includes a morbidly obese mother, a mentally disabled brother, two sisters -- the older one trying to help him keep it all together -- and the stigma of a father who killed himself. Johnny Depp's character, Gilbert, is the one primarily in charge of his challenged brother Arnie, who is brilliantly and genuinely played by Leonardo DiCaprio. But Johnny Depp gives no less of a nuanced performance as the sympathetic and flawed Gilbert, who is tied to his family through love and responsibility and guilt, who resents them and relies on them. I'm sure for many people it was not an easy movie to watch but I was so incredibly grateful for it. To see someone with special needs as a real person, someone who tries to get away with breaking the rules as often as he follows them; to see the stresses of the sibling who has to enforce those rules, even though he wants to break them himself was... important to me. I always liked Johnny Depp, not just because he is a good actor but because he went out of his way to take those roles that were quirky. For those of us who always felt a little outside the lines he was a breath of freedom. 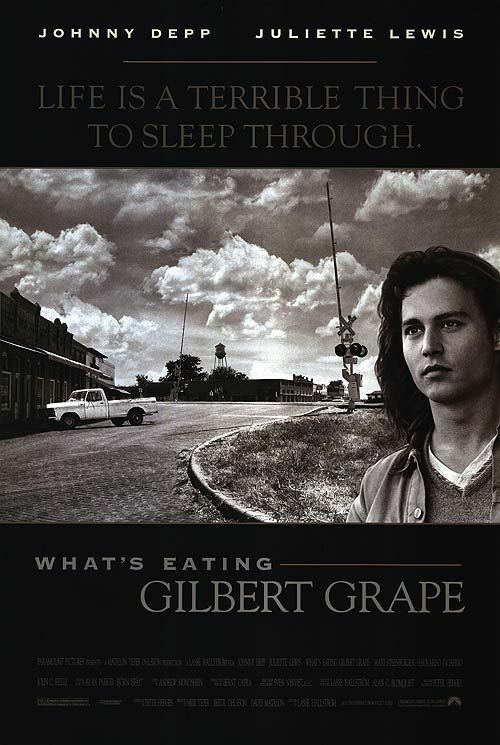 However, it was What's Eating Gilbert Grape that truly cemented my love for Johnny Depp. I think it was this performance that really highlighted Johnny Depp's subtlety and dimension as an actor. Whereas Edward Scissorhands is the metaphor for being an outsider, Gilbert Grape has real life outsiders as the central characters. I've always felt that a good movie, a good story, is one that exposes our vulnerabilities and fears, our loves and pain and joy and holds them up to say, "Me too". Maybe it's the tragic fairy tale quality that surrounds his story or Tim Burton's beautiful visuals, but the unusually gentle and potentially lethal character of Edward Scissorhands really made an impression on everyone who saw the movie. Johnny Depp played him with a sort of bizarre vulnerability that caused your heart to go out to this lonely Frankenstein creation and you leaped for joy when Dianne Wiest's demented Avon lady made one last stop at his dilapidated mansion on the hill to try her luck for a sale only to discover this poor abandoned soul. The solitude of his haunting gray existence made the citizens of the pastel-colored suburbs below embrace this odd newcomer and his "special talents" before things went so tragically wrong, causing him to be chased from the town with torches and pitchforks like all good monsters should be. I think it's the stark contrast between his genuine, naive sweetness and his ability to slice you to shreds in one fell swoop that made him so lovable. Here was a character who wanted so much to be loved and touched and NOT be lonely, but it would always be impossible for him because of the sharp instruments of death connected to his wrists. His creator is dead, the girl he loves is out of his reach, and the town is terrified of his return after driving him out. Sadly, poor Edward is doomed to live out his life in solitude far above those who treated him so cruelly, pruning his animal-shaped shrubbery and dreaming of the beautiful teenaged girl he loved once. A movie based on a novel? Sure. A movie based on a comic book? That works. A movie based on a TV show? Yeah. A movie based on a theme park ride? 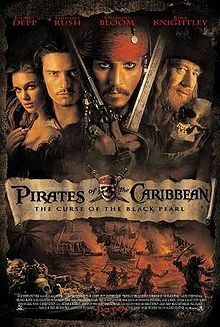 When they announced that Pirates Of The Caribbean, a Disney animatronic ride that I had first ridden when I was 13, was being made into a feature film, I shook my head in wonder. Had Hollywood finally reached the bottom of the barrel? Were they so bereft of ideas that they were just pulling ideas from their vacation photos? We showed you ours, now show us yours! What's your favorite Johnny Depp movie role? Have your say in the comments! Also, we're giving away a copy of Cry-Baby!